Chu Chua Cottonwood Provincial Park covers an area of large, undisturbed, floodplain islands in the North Thompson River. The typical large floodplain area is in a natural, undisturbed condition. 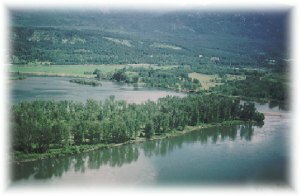 80 km north of Kamloops on Hwy #5; the park is located adjacent to Hwy #5, on the North Thompson River; access is by boat only. The closest communities, towns and cities are Kamloops, Clearwater, Little Fort, Barriere and 100 Mile House. History: The park was created April 30, 1996 as a result of recommendations made in the Kamloops Land and Resource Management Plan. The park will be managed according to the Interim Management Direction Statement for Chu Chua Cottonwood Park. Conservation: The park includes large floodplain islands in a natural, undisturbed condition. The park provides successional stages of colonization from point bar to old growth cottonwood stands. Hybrid spruce, red osier dogwood, black twinberry, carex and hazelnut trees also exist in the park. The cottonwoods provide habitat for vaux swifts, bats and Red-naped Sapsucker. Flowers, trees and shrubs are part of the park’s natural heritage, please don’t damage or remove them. Wildlife: Important habitat for bats, vaux swifts, and a variety of cavity-nesting birds. Juvenile rearing for salmonids. Park users should always be aware of bears and other wildlife in our park environment. Never feed or approach bears or other wildlife. Approved Chu Chua Cottonwood Provincial Park Management Direction Statement [PDF] is available online in pdf format. Canoe or kayak would be necessary to access the North Thompson River in this area. Always exercise caution when navigating the North Thompson River. Sweepers and log jams may not always be visible in advance. There is no viewing platform but there are wildlife viewing opportunities. This protected area is important habitat for wildlife species associated with cottonwood stands; bats, vaux swifts, cavity-nesters and other songbirds may be viewed in this park.